Get the fresh, aromatic flavors of pho in a neat, eat-it-with-your-hands package. This Vietnamese twist on a Mexican favorite wraps classic pho ingredients like beef, fresh herbs, bean sprouts, scallions, rice noodles, and a beef broth in a tortilla. Pro tip: Serve it with a side of that same warmly spiced broth for dipping. Char onions and ginger over high flame or in broiler for a few minutes. Meanwhile, dry-roast the spices by placing the cinnamon, star anise, cloves, and coriander seeds in the bottom of a dry 2-quart saucepan over medium-low heat for 1 to 2 minutes, until toasty and very fragrant. Stir frequently to prevent the spices from scorching. To the pan with the spices, add the broth, soy sauce, fish sauce, chopped carrots, and the charred onions and ginger. Bring the broth to a boil over medium-high heat, then reduce the heat to medium-low. Cover and continue simmering for 30 minutes to give time for all the spices and aromatics to infuse in the broth. When the broth is ready, set a strainer over another bowl or saucepan, and strain the solids from the broth. Discard the solids and keep warm. While the broth is simmering, put the beef on a plate, cover with plastic wrap, and freeze for 15 minutes. The edges of the beef should feel firm to the touch, but the beef should not be frozen through. This will make it easier to slice the beef thinly. While beef freezes, prepare noodles according to package instructions and set aside. Remove the beef from the freezer and immediately use your sharpest knife to slice the beef into very thin slices. Slice across the grain, and aim for slices no thicker than 1/4-inch. Once sliced,fry meat in skillet until cooked through. 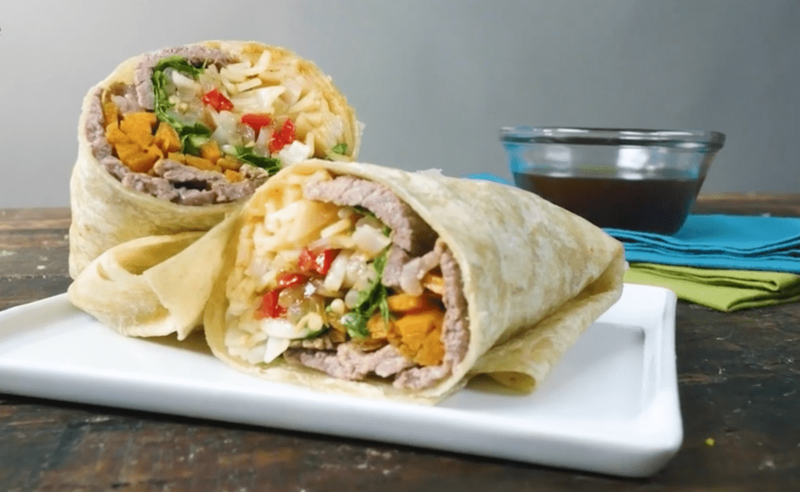 To assemble burrito, into tortilla add meat, pho broth, carrots, herbs, scallions, sprouts, peppers, lime juice, soy sauce, hoisin, noodles, and sriracha. Roll tightly and serve with extra pho broth for dipping.